Wearing a zadig voltaire kids logo print long sleeve t shirt and a grey tulle skirt is a savvy fashion option for your darling. Dark brown leather boots are a nice choice to round off this look. 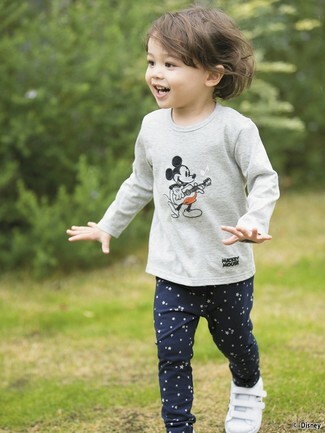 Suggest that your child go for a zadig voltaire kids logo print long sleeve t shirt from farfetch.com and navy star print leggings for a fun day in the park. The footwear choice here is pretty easy: round off this getup with white sneakers.